Learn to build with a variety of different materials. Experience the ways forces such as gravity, compression, and tension affect a structure?s stability. Develop scientific dispositions including curiosity, eagerness to explore, an open mind, and delight in being a builder. 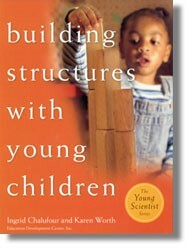 "Building Structures with Young Children is a timely book because of the blending of science with applications like building and construction in the classroom. Building Structures is teacher-friendly, with hypothetical teacher questions answered in helpful ways. The answers focus on what to do and why things are done. The book is full of examples. It emphasizes teacher observation as one of the most effective ways to assess skill development in children."